Getting free YouTube views, without spending money on ads, comes down to using the platform itself properly, as well as optimizing off-site tools that anyone can access. Simply uploading your best content, and hoping for the best, will not cut it as you need a strategy. This article is going to tell you how to develop your strategy using tools which YouTube makes freely available. With that vital aspect sorted, I will then help you learn tactics to be used off of YouTube to get those views you’re after. Stay tuned for a bonus at the end with free YouTube view providers! They have kept this as their feature video for months now. They no doubt planned for this video to be big, starting with the content itself, as well as how the video ties into their newly-released brand of snacks. The ways that you can promote this video to the maximum are going to be everything we look at below. Be sure to do what you can for every point below for this video, and continually do the other tasks for videos where tips roll over from video to video. Donation cards for nonprofit companies. Sending traffic to your website with a URL Card. Pushing people to vote on polls. You can use Cards five times during your videos. It depends on how long your video is as to how many I’d recommend, but three cards during the average five minute video is the most. The best time to place a card during a video is right when you notice your viewers typically stop watching your video. The reason I say above to only use three of your five cards during a video is because you should have two ready for your end credit scene. This is a crucial moment for getting more views as it’s your chance to lead viewers to their next video – and it should be one of yours! 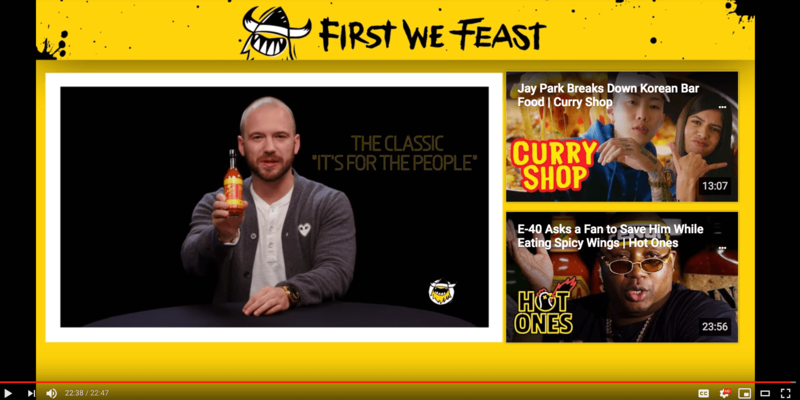 The top directs to a different videos series on their channel, the bottom one directs people to the previous video from the Hot Ones series. They could have used a third for subscribers, but they’ve chosen to drive views over subscribers in this end card. YouTube has many ideas and suggestions on how you can create and edit your end screens. The choices will ultimately come down to your branding, but driving views should be a huge goal. I don’t know about you, but when I’m on YouTube it’s because I’m feeling lazy. I don’t wanna go outside, I don’t wanna surf TV for something good, I don’t wanna think! Sorry for the ‘don’t wannas,’ but I’m driving home the point that you want to make it as easy as possible for more people to watch your content, and Playlists do just that. By date, so viewers can watch everything from the last week/month. By theme, this allows viewers to see all of your thoughts on one subject. By series, if you create different ongoing video series it is a must to create this type of Playlist. By guests and actors, why not give your viewers the people they want to see all in one place? That is just eight of 70+ Playlists that they have created. It takes time to create these Playlists, but they payoff in the long run as they increase your views on a long series of videos. You can’t just comment on how great you are in your own videos and build credibility, you have to go out and participate in the larger YouTube community. The basic way to do this is by commenting on other videos which are closely related to your niche. Answer questions which are raised in the video. Offer useful feedback to what was discussed in the video. Reply to other genuine comments on the video. Commenting with your own video URLs to specific videos which add to the content. These are all contingent on being useful to someone. You have to be sure that you’re contributing and not spamming. 10,000 likes, and 200+ replies, probably kept them pretty busy! Keyword research: Proper keyword research and use can vary widely from one genre to another. Those with daily vlogs will want to see what’s trending right in the moment, with Google Trends being a good tool. 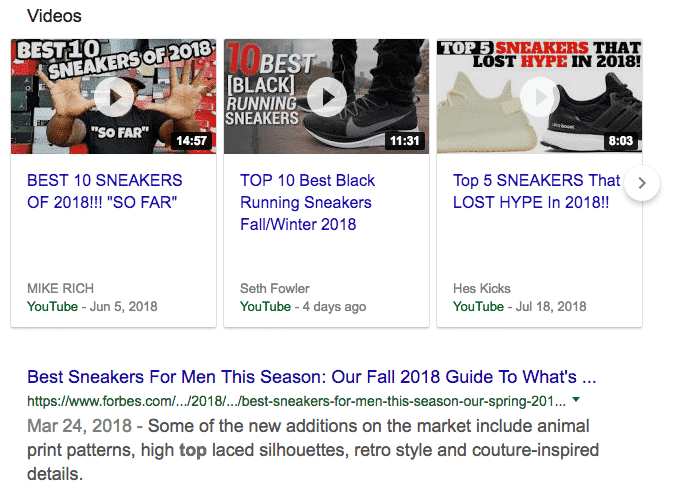 Channels with ‘how-to’ videos will want to see the longer-term trends for content, with Keyword Planner being the tool to use here. You need to look at your competitors and see how they are using keywords as well for opportunities, and to see what mistakes to avoid. Title optimization: You have to clearly state what your video is going to be about in your title. I know people like to be cute with “You’ll never guess…” style titles, but you have to at least hint as to what they can’t guess at in the title. This includes using your desired keyword in some way. 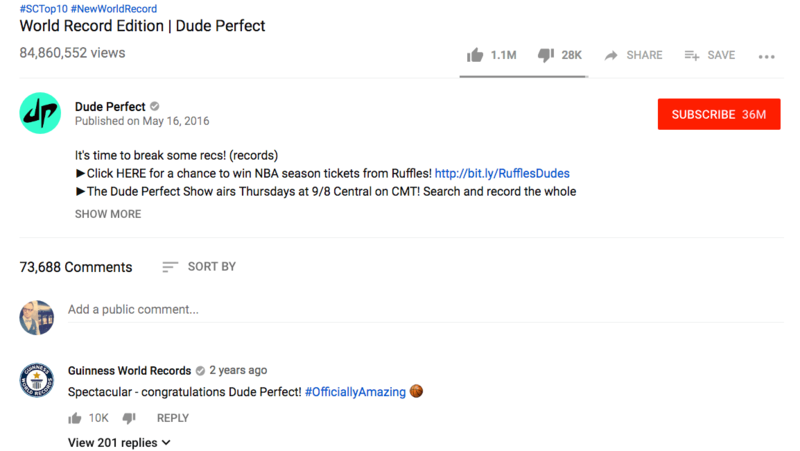 Using video tags: The trend of old with tags was to tag everything remotely related in hopes of snagging some views from trends, like a rock band tagging ‘Justin Bieber baby’ to get views from Bieber fans. The problem with this is that Beliebers quickly stop watching the video, or ignore it entirely, and Google slowly learns that your video isn’t good and doesn’t rank it for anything. Only use relevant tags to avoid this. Driving engagement: This should have been included in the section above as it occurs on YouTube, but engagement is such a key aspect of SEO that I’ve included it here. You need to tell your viewers, using audio and visual cues, to like your videos, comment on them, and subscribe to your channel. Every action taken by a viewer is another ‘vote’ telling Google that your video is worthy of some attention, which drives it higher in search engine results. These four points should be the basis of your SEO strategy. Feel free to read more resources here on our website related to video SEO. You get a little excerpt from your description added, and you’d be wise to better optimize it than the examples above as they don’t really push hard to convey details of the video or a call to action to view. You need to use each platform to its fullest extent, using calls to action unique to it (“Please retweet” on Twitter, “Please share” on Facebook, etc), and at times when that audience is most active. The bonus here is that pushing people from another platform to YouTube helps you rank better in YouTube’s search results. YouTube wants people on YouTube. Period. Sending them from Twitter to YouTube is a point in your favor in regards to YouTube’s ranking algorithm, helping you out even more. Don’t limit yourself to YouTube-centric groups. Participate on a Pinterest knitting board if you make crafts, go on an automotive message board if you do car reviews, and keep your finger on the pulse of your fitness community on event boards for your exercise videos. Keep looking and you’ll find your people somewhere online! Contact them to see if they want to collaborate on a video or some other content. Befriend them, work on a real relationship, and have them share your content. @Tag them on social media platforms when you mention them in your videos to see if they’ll share your video. Analyze their most shared content and create some of your own. Speak with their fans in genuine conversations. Influencers are a huge source of free views if you use them right. Here’s Smosh tagging Joe Bereta who they collaborated with on this video. The tag let’s Joe know that he should come by and retweet it, or maybe reply and talk to fans so that they can build some rapport, and Smosh get more exposure from his retweet and attention. Getting free YouTube views: Bonus! Check out our reviews of those providers, then click on over to their websites so that you can enjoy a few free YouTube views on them!